The HP netwok analyzer, 8714C. 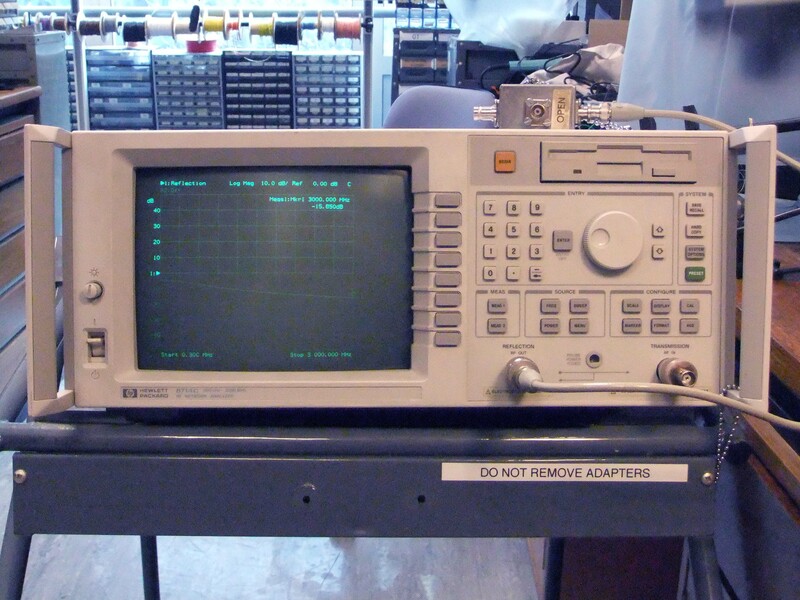 This page is a 'get you started' guide to the large, free standing RF vector network analyzers (VNAs) available within the Electrical Engineering Teaching Laboratories: the HP8714B and HP8714C. These 'vintage' instruments are no longer supported by their manufacturer but have the advantage that you can wheel them over to your experiment. By comparison, the modern LA19 analyzers, although very much more compact, are essentially fixed installations. In the simplest terms, you might think of it as sophisticated type of component bridge that uses AC to determine reactance as well as resistance. More specifically, you use a network analyzer to make measurements on (analyze) circuit types (networks) that can be treated as 'black boxes' with either one or two connections (ports) to the outside world. Data acquired during these measurements derives from the magnitude and phase of signals returned from your test circuit in relation to the magnitude and phase of a signal supplied to your circuit from a source within the analyzer. Typically, you measure over a range of frequencies during continuously repeated sweeps between the lower (start frequency) and the higher (stop frequency). For the 8714, these must both be between 300 kHz and 3 GHz. The results are returned both graphically (on screen) in real-time, and numerically (to a file). Measurement results can be presented as the scattering parameters, S of your network. Using the analyser's two RF connectors you can determine S11 and S21. However, because it lacks a generator to supply port 2, and because there is no directional coupler behind the 'RF In' connector, you cannot use it to determine S22 or S12 simultaneously. 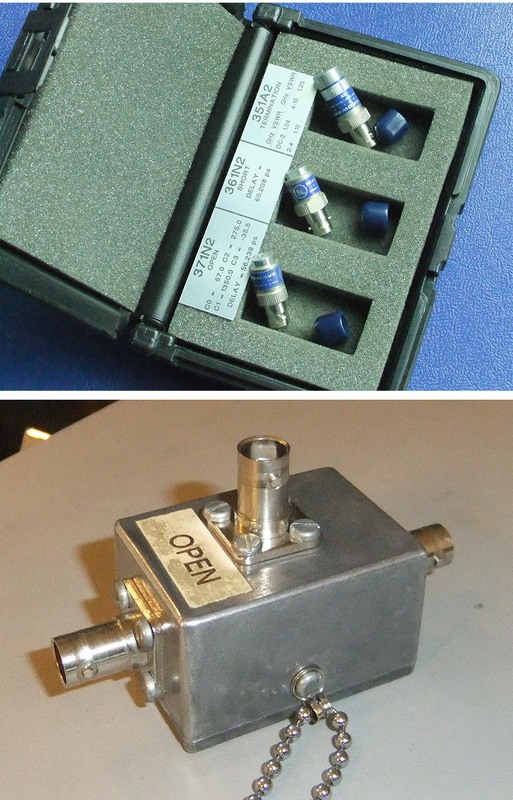 The key part of an analyzer is the directional coupler inline with the 'RF Out' connector. This device samples the signal coming out of the analyser (the incident wave) separately from the signal going back into it (the reflected wave). These samples are fed to amplitude detectors where the in-phase and quadrature components are measured on both the incident and reflected waves. Another detector looks at signals entering the analyzer via the 'RF In' connector. If anyone else has used the analyser previously then you may wish to begin with it in the default configuration by pressing the PRESET key. A screen dump from the HP8714 in reflection mode showing the magnitude of the return signal from 10 metres of RG58 coaxial cable. There are two main operating modes: reflection and transmission. Reflection mode uses a single connection between your circuit and the analyser. Although this is the connector labeled 'RF Out', it is important to understand that the fraction of the signal coming from the generator inside the anayser that is reflected by your test circuit is measured as it goes into this same port. The proportion of signal returned is a function of the reflection coefficient, Γ, of your test circuit's input port (port 1). When the test circuit presents an impedance of 50 + j0 ohms, Γ is zero and no reflected wave returns to the analyzer. If the impedance is 0 + j0 then Γ is -1 and the reflected and incident waves have the same amplitude but have a 180 degree phase shift imposed. If the impedance is ∞ + j0 then Γ is 1 and the reflected and incident waves again have the same amplitude but no phase shift is added. To see the value of reflection mode, consider the three screenshots at right showing reflection measurements on an open ended, ten metre long section of 50 Ω RG58 coaxial cable. The first measurement is the magnitude of the reflected signal: |S11|. This is actually somewhat uninformative because it merely confirms that, when it reaches the open circuit end of the cable, most of the signal is reflected back to the VNA, and does so regardless of frequency. There is only a loss of about 10% due to resistive and dielectric losses in the cable and connectors. The phase of the return signal. Of greater interest is the phase measurement: ∠S11. This shows the lowest frequencies are returned without appreciable phase shift, as you might expect. However, as the frequency is raised the time taken for the signal to travel to the end of the cable, be reflected at the open circuit, and then travel back to the VNA, becomes a larger proportion of the time for one complete cycle (360°). The VNA interprets this as a phase lag. When the frequency reaches the point where the ten metre physical line length represents an electrical length of one quarter wavelength (λ / 4, @ 4.9 MHz) then the reflected signal arriving back at the VNA is 180° behind the incident wave. The incident and reflected waves cancel each other and the voltage at this point on the line is zero, producing a standing wave node. There is still current flow into the line, so the impedance looking into the line, Z = V / I, is zero. More about impedance below. At still higher frequencies the phase lag goes on increasing to 190, 200, 210° etc. in real terms. However, such shifts are mathematically equivalent to phase advancement by 170, 160, 150°, so the VNA reports them as phases leading by those amounts. As you continue up towards 9.8 MHz the phase lead drops back towards zero because the line is then λ / 2, and the signal effectively undergoes a 360° shift over its whole journey. The process just described repeats each time the line becomes a multiple of λ / 2. Now you know that ten metres of line represents λ / 2 at 9.8 MHz, you can calculate that the velocity of the wave is 1.96 · 108 m s-1. This is a velocity factor of about 65% against a data sheet value of 66%. A Smith Chart display of S11. The last reflection mode screenshot shows the display when the 'Smith Chart' format is selected. This is most useful when you must consider the impedance of your load. More exactly, it is the impedance of your load and the cable connecting it which you find. The Smith Chart is an attempt to represent both magnitude and phase on the same graphic and, in that respect, it bears similarity to a polar plot or a Nyquist diagram. Results are plotted parametrically by frequency as the locus of points whose position horizontally is given by the in-phase component of the relected wave and whose position vertically is established by the quadrature component. The amplitudes are normalised relative to that of the incident wave, and therefore have an amplitude of 1.0 at all frequencies in a loss free system in which 100% of the incident wave is reflected. In practice, for your ten metre line, the losses reduce this amplitude to about 0.9. What does vary with frequency is the phase, which starts from near 0°, falls to -90°, -180°, then +90° before returning to 0° once again. In this way the vector sweeps out an approximate unit circle around the periphery of the Smith Chart. You saw earlier that with the ten metre cable open circuited at the far end then at 4.9 MHz the VNA in fact sees a short circuit. This is called an impedance transformation. At the lower frequencies the VNA thinks that it is looking into a slightly capacitive load. Between 0 and 4.9 MHz the cable will present intermediate values of impedance. To set up for reflection mode press the MEAS1 button and then the Reflection softkey. The signal transmitted via a 20 dB attenuator. Transmission mode differs from reflection mode in that the measured parameter is S21: the signal from the output port of your test circuit wrt the input port. This is very useful when you need to assess an amplifier, filter or attenuator. Obtain transmission mode by pressing the MEAS1 button and then the Transmission softkey. Transmission mode does not support the Smith Chart display. A vector plot generated from downloaded data for reflection in a 10 m line. Data can be extracted from the VNA via a DOS formatted 2.5 inch floppy disk. At present the HPIB interface is not used. To obtain a table of values for the I and Q readings, press the SAVE RECALL button, then Select Disk. You then are given the option to choose the Internal 3.5 inch Disk. Then press Prior Menu softkey, followed by DEFINE SAVE softkey. You then use the DATA softkey to specify that you want the actual measurements saved. If you don't want the VNA Instrument State or Calibration saved then use those softkeys to turn them off. File Format should be left on HP 8711C Compatible. Press Save ASCII and Touchstone Format. Finally, Save Meas1. The data should now be written to disk as a file named TRACEn.S1P. You can also obtain a screen dump or hardcopy. Push HARD COPY, followed by Select Copy Port. Turn the data wheel in either direction until FILE HPGL Internal Disk is highlighted. After Prior Menu hit Start to write a file like PLOT4.HGL. You may need to use conversion software such as hpglview if you cannot use the hpgl format directly in subsequent page layout operations. BNC type calibration kits. Top: A commercial kit for precision work. Bottom: A homemade kit for everyday use. As the ten metre coaxial line example above shows, the VNA sees an impedance due not just to your test circuit alone, but as transformed by whatever length of cable and connectors happens to link it to the VNA. However, only the impedance of your test circuit by itself is normally of interest to you. This is the case, for example, when measuring the properties of an antenna. The VNA can compensate for cable effects through a feature called calibration. The VNA contains a default calibration data set which assumes your test circuit connects directly to the front panel without an interposed cable. When you need to use cable, first setup MEAS 1 (say) as a reflection measurement over whatever range of frequency you're interested in. Then press the CAL button. The softkey One Port will then start the calibration run. The VNA will then prompt you to connect an open circuit to the end of the cable. You confirm that has been done and then the VNA requests a short circuit. Finally, you provide a 50 Ω load. Note that, even after you calibrate, phase errors towards the highest frequencies of operation will remain. This is because capacitive effects are impossible to eliminate in even the highest quality standard open references. At the top right of the display you now see the letter C, indicating that a user-derived calibration is in effect. This will remain in operation even after a restart of the VNA, or PRESET. If you subsequently narrow the frequency sweep then the display changes to C? indicating that the VNA is 'interpolating' between the remaining calibration points in an attempt to maintain accuracy. However, if you broaden the sweep limits then the calibration will be invalidated and the VNA will revert to the default calibration set. You can also return to the default calibration by CAL followed by the Restore Defaults softkey. The calibration data may be saved to a file by SAVE RECALL then the Define Save softkey followed by Cal ON. Use softkeys to turn off other data saves. Then Prior Menu and Select Disk to choose the destination. Then Prior Menu and Save State to write a file such as STATE33.STA. The RF detector at the input of the analyser may be damaged when fed a signal exceeding +23 dBm (200 mW, or 3.2 vRMS). To avoid this risk when testing active circuits, connect the VNA before powering your circuit, then turn up the supply gradually. Disconnect the VNA only after turning the supply down. If you really must remove the N to BNC RF adaptors on the front panel then please ask lab staff beforehand. Last modified: 2013 May 29th.